Are superfoods the powders that we blend into smoothies and sprinkle onto our porridge or are they just normal foods that have special benefits? We think it’s both! Read on to learn more about some of our favourite superfoods and how you can incorporate them into your diet. Sweet and tasty, blueberries are available in every supermarket and in the freezer section all year long. Their deep blue colour tells us they contain the antioxidant chemical anthocyanin. Antioxidants may help to positively dampen down our normal chemical processes, particularly if we do lots of exercise. 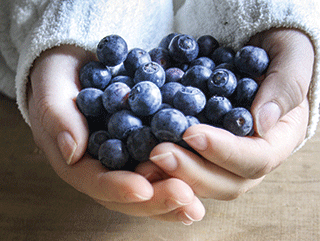 In terms of health, research isn’t conclusive but suggests that blueberries might be beneficial for heart health. Blueberries have a low glycaemic load (GL) rating, which means they are a great snack choice for blood sugar balancing. Many people find that blood sugar balancing helps them avoid afternoon dips in their energy and mood. Blueberries are a good source of vitamin K, which is needed for blood clotting, and they also contain vitamin C.
Add a large handful of blueberries to your porridge, have them as a tasty morning snack or blend them into a breakfast smoothie with some natural yoghurt. You can also make use of blueberry concentrate to create a delicious drink after exercise. These little black and white Mexican seeds are relatively new to the UK, but they’re easy to find in health food stores and many supermarkets. They contain the essential fatty acid omega-3 which is vital for our health because all our cells are composed of fat and omega-3 in particular has anti-inflammatory properties. Chia seeds are also a good source of carbohydrates, proteins, fibre, antioxidants and calcium. They are a great addition to both vegetarian and non-vegetarian diets. Sprinkle them onto your breakfast or a salad for an energy boost, and try adding them to your baking. If you mix them with some liquid then they’ll create a gel which can be made into an enjoyable pudding. Try a combination of chia seeds, almond milk, blueberries and cinnamon. Some people find this gel version a gentle way of adding additional fibre to their diet. Quinoa originates from Peru and, although it looks like a grain, it’s actually a seed. It is gluten-free and also a vegetarian complete protein. A complete protein is one that contains essential amino acids; these are the building blocks of protein and we need to get them from food. Other complete proteins include hemp and animal products. Quinoa has more protein than other grains, but not as much as an animal protein. 100g of quinoa provides about 4.4g of protein compared to 100g of chicken providing about 25g of protein. Cook quinoa like rice and follow the instructions on the packet. It tastes good warm, or cold in a salad. Try adding turmeric for extra colour and anti-inflammatory properties, chick peas for extra protein and some small pieces of dried apricot for sweetness. Add in some of your favourite herbs and a drizzle of olive oil. Spirulina is a blue-green algae more commonly recognised in its powder form. It has been consumed for centuries in many parts of the world such as Latin America and central Africa. Research suggests that it has antioxidant and antimicrobial properties and can help to support the liver and immune system. It is not recommended to be taken by anyone with an autoimmune disease, such as multiple sclerosis, rheumatoid arthritis or lupus, so it is advised to check with your healthcare provider first before taking it. 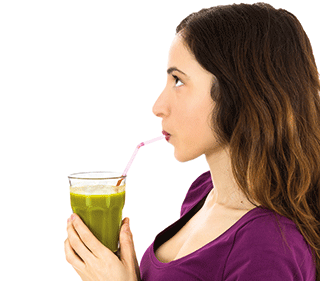 Add powdered spirulina to juices or even your porridge. Look out for it in foods such as protein snack balls or try making your own with a combination of dates and nut butter. If you like chocolate and want a healthy alternative then you should definitely try cacao, which is a good source of magnesium and iron. You can buy it as a powder or in the form of cacao nibs. It’s the raw form of chocolate, so you get the benefits without the sugar! A tablespoon of cacao nibs adds a great crunch to porridge and homemade flapjacks. Do bear in mind that, like chocolate, cacao contains caffeine, so it may affect your sleep. If you fancy a hot chocolate then you can try warming almond milk, adding cacao powder to taste (try a dessertspoon to start), some honey for a touch of natural sweetness and a sprinkle of cinnamon. Turmeric gives curries their deep yellow colour. It’s used extensively in Indian cooking and is easily available as both a spice and a supplement. If you’re lucky you might be able to find turmeric root – it’s from the ginger family so looks similar. The beneficial chemical is thought to be curcumin and turmeric might be recommended for many inflammatory-type conditions such as arthritis and digestive and mucous concerns. It’s also a good source of iron for energy, and manganese for our bones and skin. To get the benefits of turmeric you can add it to curries, to rice and even to warm milk for a soothing drink. Kale is easy to find in the supermarket, exciting to grow in the vegetable patch and can also be found in the form of crisps. Kale is a good source of magnesium, which may have a calming effect on the nerves and muscles. It is also rich in vitamin K, which is important for healthy blood, and contains the vitamins A and C which support immune health. Kale contains a number of different flavonoids with a variety of antioxidant and anti-inflammatory effects. Like other cruciferous vegetables such as broccoli and Brussels sprouts, kale contains sulforaphane, a compound which is thought to have anti-cancer properties. Serve it steamed and try cutting out the stems unless it’s really young. Lightly stir fry with garlic cloves and coconut oil. If you have a dehydrator then you can create tasty kale crisps with some nutritional yeast or salt and pepper.